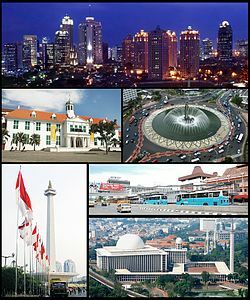 ↑ "Travel Indonesia Guide – How to appreciate the 'Big Durian' Jakarta". Worldstepper-daworldisntenough.blogspot.com. 8 ᱮᱯᱨᱤᱞ 2008. Retrieved 27 ᱮᱯᱨᱤᱞ 2010. ↑ "A Day in J-Town". Jetstar Magazine. ᱮᱯᱨᱤᱞ 2012. Retrieved 2 ᱡᱟᱱᱩᱣᱟᱨᱤ 2013. ᱣᱤᱠᱤᱢᱤᱰᱤᱭᱟ ᱠᱚᱢᱚᱱᱥ ᱨᱮ Jakarta ᱵᱟᱵᱚᱛᱫᱽ ᱛᱮ ᱨᱮᱫ ᱢᱮᱱᱟᱜᱼᱟ ᱾.